Even as ranking India 80th in Global Hunger Index (GHI) among 104 developing countries, a new study, carried out by a group of research organizations led by the Washington-based International Food Policy Research Institute (IFPRI) says that the country’s has been able to successfully fight against child undernutrition in India after 2005. The study is based on a calculation of four indicators: percentage of the population that is undernourished, of children under five years old who suffer from wasting (low weight for height), of children under five years old who suffer from stunting (low height for age), and of children who die before the age of five (child mortality). 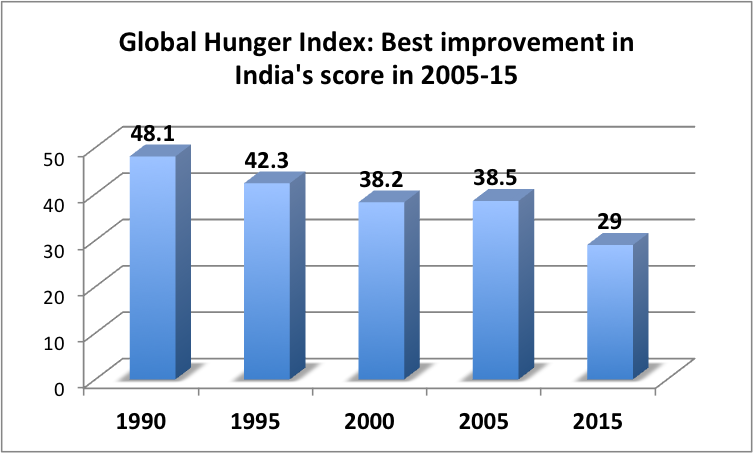 The calculation results in “GHI scores on a 100-point scale where 0 is the best score (no hunger) and 100 the worst” the study says, adding, “Across regions and countries, GHI scores vary considerably.” India’s GHI was 48.1 in 1990, reduced to 42.3 in 1995, slightly came down to 38.2 in 2000, then increased to 38.5, and went down to 29.0 in 2015. 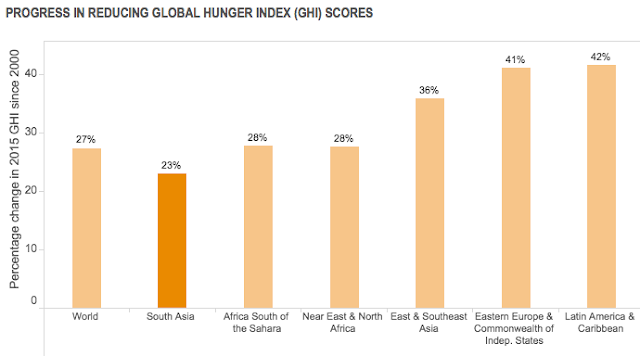 The best GHI score is of Kuwait – just 5.0 – and the worst is that of the Central African Republic, 46.9. While Pakistan, with a GHI score of 33.9, ranks 93rd, one of the worst in the world, Bangladesh, with a GHI score of 27.3, is a little better than India, ranking 73rd. Among the BRICS countries, which India considers as its main competitors, Russia’s GHI score is 6.6, ranking 11th. Brazil is found to be much better than all the 104 countries with a GHI score of less than 5.0 and has not been included the list. As for China, it ranks No 21 with a GHI score of 8.6, and South Africa with a score of 12.4 ranks No 38th.